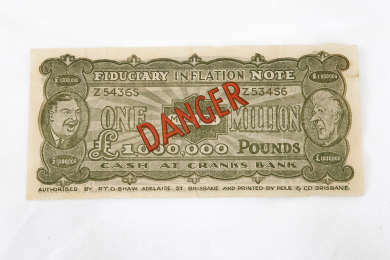 The ‘Million Pound Note’ is a piece of political advertising produced for the 1931 Federal Election in support of Joe Lyons and the United Australia Party. 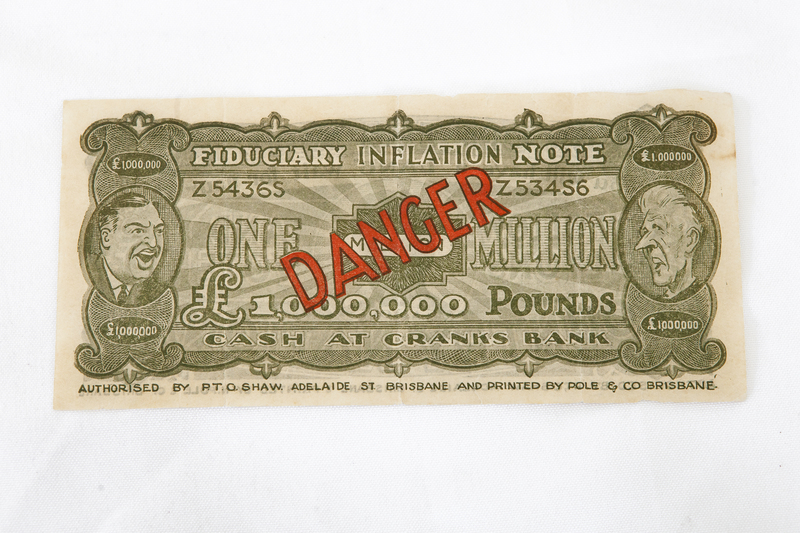 The note satirises the inflationary effects that would arise from adopting the Australian Labor Party’s policy response to the growing national debt. The 1931 Federal Election was triggered by the collapse of the Scullin Labor Government, which occurred when a faction of Labor Party members crossed the floor to vote against the Government. The years preceding the 1931 election had been a tumultuous time in federal politics, with the government struggling to deal with the effects of the global economic depression and internal dissent within the ranks of the Labor Party. The government faced a crisis of shrinking revenues, a collapsing economy and Commonwealth Bonds to the value of £28 million due for redemption. 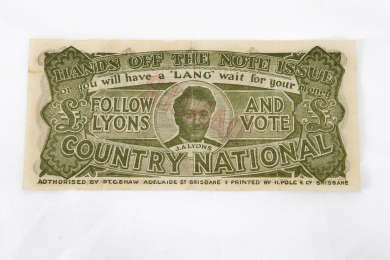 Joe Lyons, who had been elected to parliament as an ALP candidate in 1929, was appointed as Acting Treasurer while Prime Minister Scullin travelled overseas, and advocated a policy of economic restraint and reduced government expenditures. A rival faction within the party, led by Ted Theodore, opted instead for a more ambitious policy of credit expansion and money printing. Seeing this as economic suicide, and banking on the support of Prime Minister Scullin, Lyons pushed through his reforms. However, on his return to Australia in 1931, Scullin made the decision to reappoint Ted Theodore as Treasurer. This lack of support so outraged Joe that he resigned from the Cabinet on the 13th March 1931 and later voted in a ‘no confidence’ motion against the Scullin Government. These dramatic events positioned Joe Lyons at the centre of federal politics and, working with an influential group of prominent journalists, businessmen and political figures, he used this momentum to found the United Australia Party as an alternative political force. 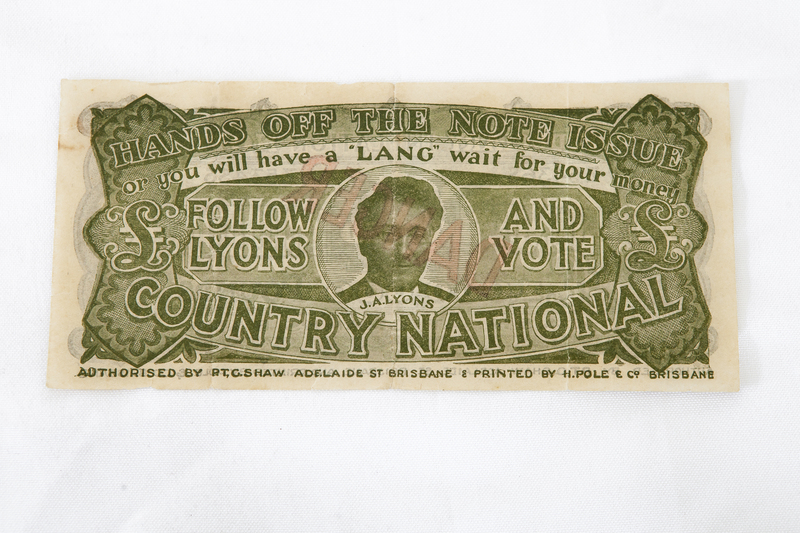 At the federal election in December of 1931, the UAP campaigned on a platform of financial responsibility and prioritising the interest of the ‘common man’, with ‘Honest Joe’ Lyons, as he had come to be dubbed in the press, as its figurehead. The UAP won a crushing victory in the election, securing enough seats to allow Joe Lyons to form a majority government and become Prime Minister.